I’m not exactly sure how to start this off. Up until the 88th minute I was going to say we got 3 points with relatively no fuss. But then, this trend of complacency and missed chances resulted in Getafe getting an 88th minute goal from Manu and us honestly scrambling to finish the game with the 3 points. Getafe had two decent sights on goal and if we had thrown away those 2 points, it would have been the most shameful and pathetic result in Guardiola’s era. Johan Cruyff said midweek that people are overreacting to amount of chances we are missing, but, I somewhat disagreed then and after tonight I disagree strongly. So it started, and once again, as annoying as it is, the game plan of our opposition was as clear as it was predictable. Get use to it guys, we are barely going to get an open/”fair” game anymore, all teams are going to sit deep, defend with 9, and then hope for the counter attack or longball. Still, we started the half well and despite having to be patient in our build up, we were getting through enough. Messi, who essentially plays a freerole these days, started the game off picking up the ball very deep, but the consequence of this, is that his late runs into the box are more difficult to mark. In the 8th minute that strategy nearly worked when Xavi put Messi through with an excellent lobbed pass, and our little genius nearly scored a pearl of a goal when he tried to bicycle kick it past Codina. Luckily for Getafe, their goalie rushed out well and blocked the shot. A minute later we had another decent chance when a through ball to Villa was somehow not collected by Codina, but the effort from the cut-back was not well utilized. Still, despite barely having a touch for most the first 15 minutes, Getafe put a decent spell of possession together (which our crowd was not enjoying) and it finished with a very decent chance for Arizmendi, that he thankfully squandered. However, we did get the breakthrough in the 17th minute, and it was with some style. We are treated to many wonderful team goals, full of clever touches and smart finishes, but we are not treated to a large amount of just cracker goals. Well, tonight we were. After an unsuccessful corner kick, we put in another rather hopefully ball into the area, and Cata Diaz cleared it with a header. The ball came towards Dani Alves and you could tell immediately he had no other idea but to give the ball a proper crack and to my surprise, he hit the half volley perfectly and it swerved with venom into the far corner. Simply an awesome strike. Just a few minutes later, I was again surprised, this time that we did not make it 2-0. Villa got the ball on the left side, cut in sharply, and Cata Diaz left a trailing leg in the tackle and made no contact on the ball whatsoever. Personally, I think there was enough for a penalty there. But, it was not called. However, as Getafe tried to clear from that incident, Iniesta robbed them and fed Messi on the right who was all alone. Now, for some reason he didn’t just slot it past Codina, which seemed the easy option. Instead he tried to dribble the keeper and cut the angle rather tight and his right footed effort was to lateral and not on target. It however fell to Villa on the left, but he hit it high and wide. The word unclinical again came to mind. 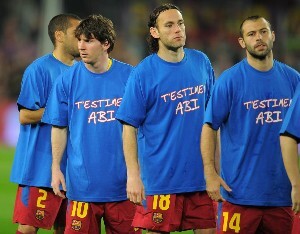 In the 22nd minute the crowd applauded for 60 seconds in support of Abidal. This was an awesome gesture as were the t-shirts we wore before the game started. Between the 28th and 32nd minute we had a few more chances. Pique got a header off a corner, Villa had another penalty claim (that he was booked for diving, and in honestly, he did play for it), and finally after a smart dummy from Iniesta a shot from Villa from the left was blocked by a flying defensive tackle. But, despite the fact, nearly every comment above was chances for us, we nearly conceded in the 33rd minute and it highlighted ever so brightly the need to score more than one. A cross form the right side came in, Pique slipped but as he did touched the ball into the path of Casquero. Lucky for us, his shot was far from convincing and Victor Valdes was in the right place to make another very important and timely save. We had two more chances before the half. In the 36th minute Alves cut the ball back perfectly for Xavi, but his shot from the edge of the box just went wide. And juset before half time, Villa had a good chance. He had been trying to make early runs all night but was not getting the pass he craved. Finally, Pique spotted the run, played a lovely long ball towards him, and eventually the ball did fall in the box for Villa, but he lashed the shot into the side netting. So, halftime, still 1-0, but really, we again should have had at least 2. At least it only took 4 minutes to get that second goal. Messi played Bojan in on the right, he checked on to his left got, had a strike, and a wicked deflection of Cata Diaz gave Codina no chance. This proves that having a shot on goal, not trying that extra impossible pass, allows you to have these fortunate moments. In the 56th minute, we missed another chance (shocking huh?). Iniesta played a wonderful pass through the defense to compliment Villa’s perfectly timed run, and our number 7 was clear through on goal. Incredibly though, he tried to square it for Messi instead of just opening up his body and slotting it into the far corner, something Villa has done 100eds of times. Some point to these moments as a sign the striker lacks confidence. In truth, the option to an open Messi was not bad, the execution just was. Instead of getting some outward swerve on the pass it was too straight and Codina could smother it. But just 2 minutes later Villa gets no such leniency; he just flat out squandered a sitter. He got the ball at the top of the box, turned nicely to be facing the goalie, but his shoot was both weak and directly at Codina. I could not help but shake my head in disappointment. From then on to the end it was the same story, chances, half chances, and one chance for Getafe. Our opposition were putting in plenty last ditch tackles or interceptions to stop us, but, we are missing a very real ruthlessness and cutting edge going forward. Then, as the introduction mentioned, Getafe pulled one back in the 88th minute through a smart sidefooted volley finish by Manu from a cross. And in a game we for 88 minutes essentially strolled through, had to scramble and hold our breath. Honestly, I’m annoyed right now. We are being wasteful, plain and simple. Mess around and stroll about when you’re up 3 or 4, but until then, get serious and finish your chances. Villa’s form is not encouraging and it’s rather ridiculous he didn’t score tonight. I think for the most part we were good but those final 5 minutes really irked me. The only special mention I feel like giving is to Mascherano. Anyway, 3 points in the bag. No Barça now until after this international break. Real are away to their city rivals, but in honestly, I have next to no faith in Atletico pinching some points. In recent history, they have been gutless and useless against Real. This entry was posted in La Liga, Match reports. Bookmark the permalink. I cannot remember the last time I was so frustrated watching a game. The number of chances that we squandered tonight was just unthinkable. It wasnt just the clear cut chances, it was the half chances, where the last ball or the final decision was just so damn poor. Shooting when you should pass, passing when you should shoot. These are supposed to be some of the best attacking players in the world. I miss Pedro. Villa needs to get his act together. This is the point in the season where we need him scoring goals, not faffing about on the ball and making piss poor shots at the goalie. I couldnt believe he passed to Messi when he had the chance to open up his body and shoot. The Villa @ Valencia would have scored that goal with his eyes closed. Not sure what his problem is but he needs to get it sorted. Bojan needs to go out on loan somewhere, he just isnt good enough and he is taking up a spot in our team that should be going to a player that can actually have an impact on the game. Besides the goal (which took a very heave deflection) he was pretty much useless, at least Villa for all his wastefulness, was making the right runs. I thought Messi had a very good game. He was dragging the entire Getafe defense all over the place, but unfortunately tonight he was flanked by two strikers who didnt use the space he created well enough and when they did they wasted it. Mascherano was a full on beast. He has really clicked well with the team and his ability to read and break up attacking play is second to none. Finally. The calls, once again tonight, were ridiculous. Especially when you compare them to the calls Madrid got in their game. Makes you start to wonder if all of Mourinhos mouthing off about refs is having an effect. We definitely should have had at least one pen tonight and there was a goal dissalowed for offside that was dubious at best. Albeit the three points in the bag is all that really matters, I must say the way we scraped our wins (given we didn’t have to) recently is annoyingly pathetic. We just don’t activate in front of goal anymore. It’s like ALL our players are of the notion that; “even if we lose a couple chances, there’s nothing to worry about as we’ll surely create another” — SHEER EXTRAVAGANCE!!! Most significantly, Villa must go find the boots he wore when he scored in 4 consecutive matches (against Sporting, Arsenal…………). He’s been totally INDECISIVE and BLUNT in front of goal lately but I still cherish his awesome darts into the box so I expect him to come around pretty soon. Some of you culés might disapprove of this but if you LOOK DEEPER as I have, Bojan’s not made for Barça — @ least for now. Fine, he scored again (and luckily so — as the ‘keeper would have comfortably saved the effort if not for that wicked deflection) but that aside, what NOTABLE contribution did he offer against a substandard Getafé side (with all due respect to Getafé, please)?! NOTHING!!! And Piqué was @ it again last night. Speakin’ of Getafé’s goal, Piqué was closest to Manu (Getafé’s goalscorer) but didn’t even attempt to mark him (Oh Puyol, please return) and to me, that supposes that Piqué was literally reminiscin’ about his fantastic moments with Shakira (no offense, please) because he simply didn’t bother to get a safe hit @ the pullout comin’ into his own box — @ the 88th min, for cryin’ out loud!!!!!!!!!. I mean Manu was afforded the royal liberty of comfortably smackin’ the incomin’ cross into the net. Piqué was more of like a team mate of Manu, deliberately positioned to smash the ball into the roof of the net should Manu miss out. It’s just unpardonable!!! Please endeavour to watch the scene over before judgin’ my remarks on this and I don’t mean to imply any form of mockery or finger pointin’ — just notin’. Well, we’ve got the much–needed 3 points and that’s of course, more than enough reason to be happy. And two weeks without Barça is gonna be a bit borin’ but they (our players) need some fresh air and some days without club football too. So, all the best to all our blaugranas and every culé out there in this whole wide world!!! 7.0 for Messi?! He relentlessly worked his socks off last night with some mesmeric stunts despite pairin’ up with two almost ineffective attackers and so, I think he justifiably deserves more than that. Even goal.com — despite their stingy ratings of Messi — gave him an 8.0. Just sayin’. sure a 7 may have been a bit low, but i wont go to an 8. yeah he worked hard but he had a huge amount of ball but with too little end product. i thought he rather individualistic last night and should have released the ball to team mates more often and earlier. i suppose i rate him against his standard. Well, as Bojan scored an important goal for a second consecutive game, don’t count on me to criticize him, particularly as both Messi and Villa failed to score in these two games… To have more game time could do him a lot of good, he certainly had a far better game today than against Sevilla, and how we could do with a Bojan showing the same form he displayed at the end of last season to finish this one. Don’t take me wrong, I don’t think he was brilliant, but he works a lot, and finally shows some end product again. I don’t think it’s down to pure luck that Guardiola considers him first when he needs a replacement up front. Now Bojan needs to behave and to look less like a child, he’s 20 now and must start to be a man, sort this hair ffs and stop to go flying at the first touch, look like Messi always stays on his feet, do the same and you will earn some respect! One big positive we can take from our last run of fixtures is that we are creating as many chances as ever, and maybe even more, and this is imo due to the excellent form of Iniesta. He’s really been in top form these last days, and that’s pretty good news cos’ any bus will find it difficult to stop us if Iniesta and Xavi are at their best together. There are of course two negatives. I’m not too worried about the fact that we are missing so many chances. Yes it made our life difficult, losing points against Sevilla, letting Arsenal hope to the very end of the tie when we could have put it past them in the first half of the first game, and generally scoring far less goals than we are used too. But i hope it’s just low confidence, normally Messi and Villa should soon find their scoring boots again and all should be well. What worries me far more is the state of our defense. At moments, we’ve looked like clowns against Getafe who found it easy to go through our players the rare moments they had the ball up front. On their current form, Madrid would tear this defense apart. And in the CL, any team that will park the bus will know we won’t score loads of goals and will relish their chances to score on a few counters. Let’s hope Puyol can come back pretty quickly and steady the ship, cos’ I don’t see us winning many trophies playing at this level defensively. The break couldn’t have come at a better time. When club football will resume, it will be season’s crunch time, with everything at stake against great rivals. Exciting times in view! Visca Barça! Hey guys, it’s very very quite overhere I must say. Good news from our boys though. Villa and Affellay have scored for their Nat. team. The Blaugranas keep breaking records. Villa is now all time topcsorer for Spain. He has surpassed Raul, a former Madrista ha ha. And tonight it is Messi’s turn. All worldseyes are on Messi and so I’m hoping that he will give a great show tonight. I don’t know if the game will be live on tv overhere, I surely hope so. It’s funny though, that US citizens will be cheering for Messi. That’s how great he already is. Gooooooooooo MESSI!!! Not to forget Mascherano and Milito. Go get them guys! I didn’t watch the USA — Argentina match but inferrin’ from the reviews I’ve read, Messi didn’t score but made sure he gave them (the entire stadium cheerin’ for him) a truck–load of his sumptuous footballing genius and the Argentina goal came directly from the rebound of his assist to Di’maria. Hats off for Messi-dona!!! I’m quite happy for Villa too for outscoring the legendary Raul (one of the very few Madridistas I’ll always doff my hat for). And Afellay also gave a solid account of himself by ensurin’ that his name was on the scoresheet for Netherlands too. Overall, it’s been a fantastic footballin’ adventure for the representatives of the blaugrana jersey in their national colors and here’s to hopin’ that our team will switch into their MANITA OVERDRIVE MODE immediately after this international break. Yes, the match was live on tv. Messi had a great game and he was PHE-NO-ME-NAL!!! I’ve ejoyed him so much. He was crowded by defenders every time he runs with the ball. Team Argentina was Barca-like, especially in the first half. The 1-2 touches with our golden boy, oooh breathtaking. The team is gelling well now and I hope for Messi that he will have a great Copa America in the summer. bc9jaCulé- try to watch the game if you can. You will enjoy it very much. That was quite a generous gesture, FCB-Parbo. I’ll try and watch it right away. Thanks culé.